Italy is known for their history and their food. Some of the best food in the world is found in Italy. While traveling throughout the country, I found that I enjoyed myself the most in Rome. After eating my body weight in gelato, I feel that I have found the three best, quality, and authentic gelato spots in the city. Follow me on this journey as I describe the delectable delights I found in the city. While this may be a typical tourist destination after Audrey Hepburn and Gregory Peck's iconic visit, Giolitti truly is some of the best gelato in the city. Around the corner from a busy alley, Giolitti sits nestled on the thin side road, Via degli Uffici del Vicario. This store holds a variety of sweet, tart and fruity flavors that are satisfying for all guests. 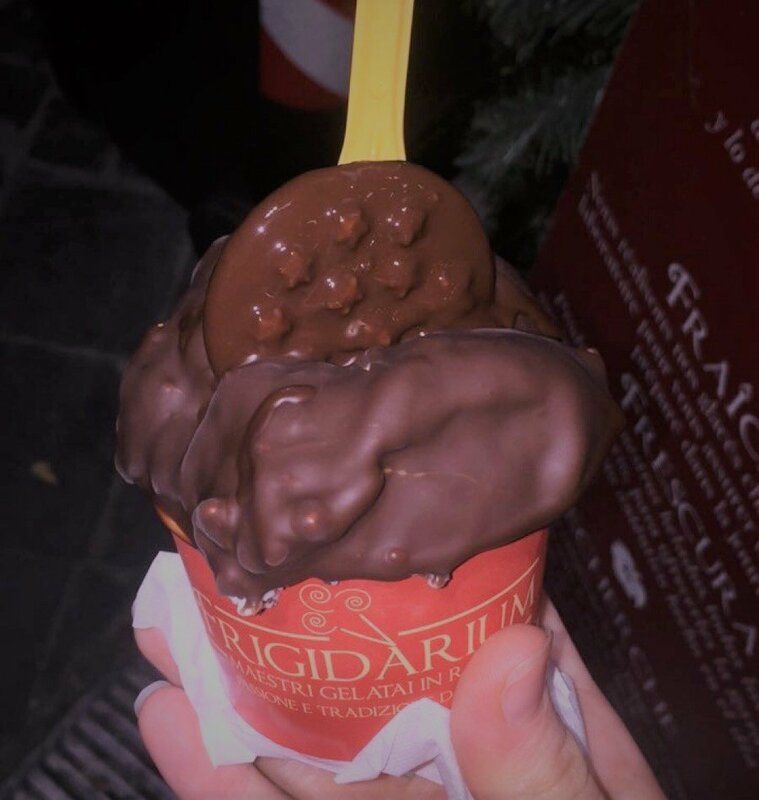 Personally, I have a slight aversion to dairy, but at Giolitti, there is the best non-dairy chocolate gelato I have ever had. Even the non-dairy flavor is robust, thick and creamy just like the authentic other flavors. For the best variety, quality and taste, Giolitti is the significant winner. 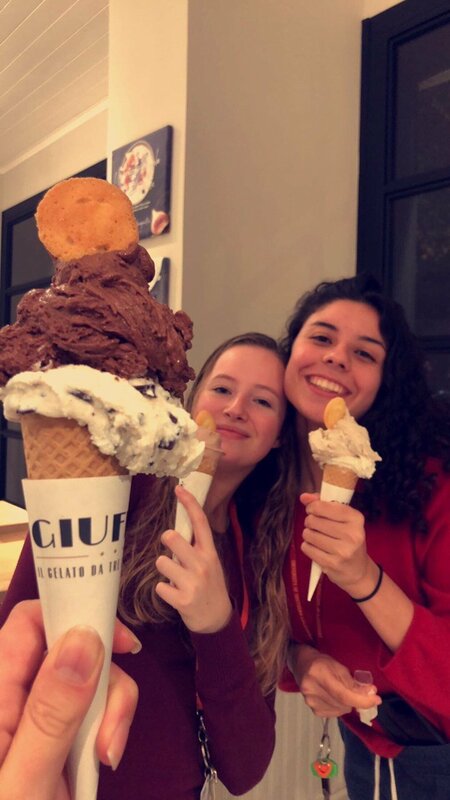 However, Giolitti gets noticeably bust and hectic which may be a turn-off to some visitors, but the taste does outweigh these slight inconveniences. TIP: at Giolitti, you pay before ordering. Remember to stop at the register by the door, pay for your cup or cone, and take your receipt to the glass! Two words: chocolate shell. Frigidarium is unique in the sense that they offer a dark or white chocolate hard shell blanket over your flavor of choice. This gives the gelato an irresistible crunch and a deeper flavor. While the gelato itself may not be quite authentic and more similar to ice cream, you cannot go wrong with stopping here. Hidden on a side road adjacent to Piazza Navona, Frigidarium is a small store that gets crowded quick, but is quite worth the wait! 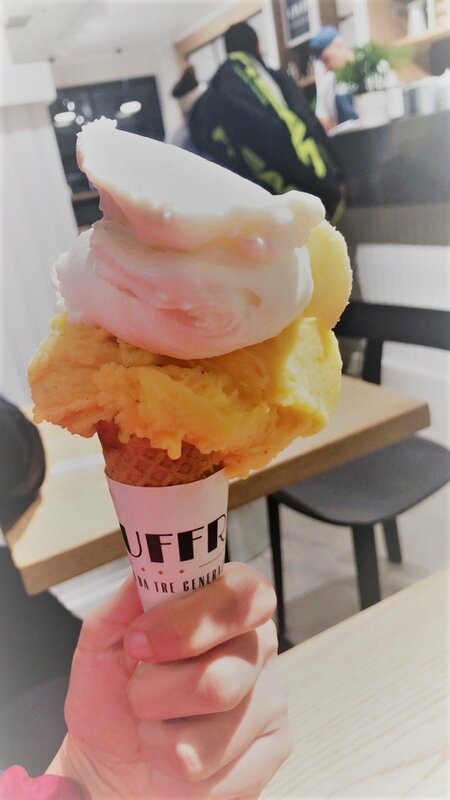 TIP: be careful when eating the shell, once the gelato begins melting it spills violently out the sides of the cup or cone causing a disaster. Giuffre is a hidden gem. In the depths of Trastevere, Giuffre holds some of the best food I have consumed in my entire life. At Giuffre, they do something innovative, beautiful, and incredible. They have two chocolate fountains, one white and one milk. If you order a cone, the sophisticatedly dressed employee will ask if you would like chocolate INSIDE OF YOUR CONE. 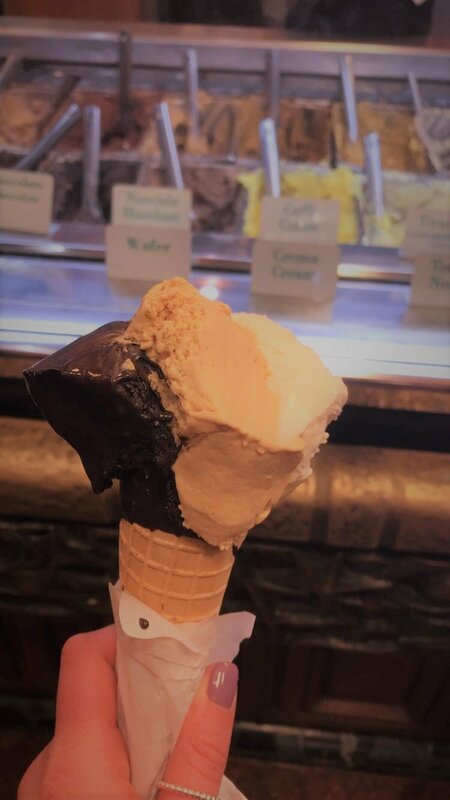 They fill the cone with melted, Italian chocolate. Then, you get to choose your flavors, varying from fruit flavors, non-dairy dark chocolate, or traditional flavors. While the menu may be in Italian, do not fear. This simply guarantees the fact that you are in for the best gelato experience of your life. Next time you find yourself in Rome, use this guide to make your dessert decision easy. All of the places listed are easy to find on maps and navigable for English speakers! What's in a cookie? Sugar, spice, and everything wonderful. If I were not in college, I would definitely be Cookie Monster’s protégé. Some people are beer experts and some people are cheese experts, but if there’s a place in the world of expertise for the infallible cookie, count me in. I love to eat cookies as much as I love making them. After extensive testing over a span of however many years I’ve had cognitive function, as well as conducting research on numerous brands and bakeries, here are my personal rankings for five of the most popular types of cookies. To me, macadamia nut cookies are not completely unfavorable by any means, but they do land on the bottom of the list for a few reasons. First, the nut-to-chocolate ratio is almost always uneven in favor of the nuts. Second, these cookies are the hardest to make from scratch because have you seen how much macadamia nuts actually cost? Rating: 5/10 not super tasty but would still happily stuff my face with them. These are the blank canvas cookies. They can be decorated with icing, sprinkles, or left plain. I don’t have a type. But they are literally just mounds of flour and sugar and leavening agents. When I’m eating something sweet, I don’t want to be CONSTANTLY reminded of just how much closer I am to giving myself diabetes. Rating: 6.5/10 because frosting them is still fun. The snickerdoodle is the hotter and spicier younger sibling of the sugar cookie. Same genes and all, but the snickerdoodle was blessed with a lil’ something extra: cinnamon. Snickerdoodles taste like Christmas and a warm blanket in front of a fireplace. Plus, that texture though: fluffy, buttery, basically eating a cloud. Rating: 8/10 would marry. Yes, oatmeal cookies. The ones everyone complains about because they wanted chocolate chip and were deceived. I’ll let you try to find a cookie that is as moist (sorry I know that word is gross) and flavorful as the oatmeal raisin cookie is. These cookies are also the most breakfast-friendly and I am a firm believer in breakfast food at any time of day. Plus, oatmeal cookies are versatile too! Don’t like the raisins? Replace them with virtually anything else—like chocolate chips or the blood of those who wronged you in the past—and you would still get a deliciously spiced cookie whose texture game is A1. Rating: 1000/10 can eat as many as you’d like and still poop the next day, Thanks fiber.